A 58-year-old nondiabetic, nonhypertensive man with hyperlipidemia was referred to radiology for a carotid Doppler ultrasound by a primary care physician. 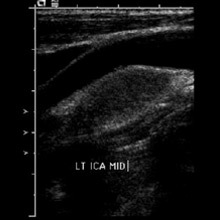 Carotid Doppler ultrasound reveals an oblong nonhyperemic 2.6 X 1.3 X 1.2-cm mildly heterogeneously hypoechoic lesion at the left carotid bifurcation juxtaposed between and mildly splaying apart the internal carotid artery (ICA) and external carotid artery (ECA) (Figures A and B). Both ICA and ECA otherwise pristine. Lesion at the carotid body on enhanced CT depicts avid enhancement and minimal central heterogeneity (Figure C) with mild anteroposterior splaying of ICA and ECA (Figures D and E). Paraganglioma is a rare neuroendocrine neoplasm arising from sympathetic/parasympathetic nervous system in chromaffin negative cells. Paraganglioma are closely related to pheochromocytoma, which are chromaffin-positive. Extra-adrenal paraganglioma arise anywhere along sympathetic/parasympathetic chain in abdomen and retroperitoneum (85%), chest (12%), and head or neck (3%). 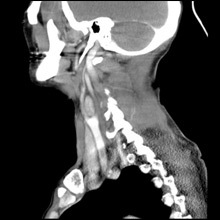 Paragangliomas in head or neck are named according to the site of origin, such as carotid body tumor glomus jugulare and vagal paraganglioma. Majority of paraganliomas are benign, with malignant degeneration evident in about 6% to 12% of cases. Most are sporadic and autosomal dominant. Paraganliomas have known associations with von Hippel-Lindau syndrome, neurofibromatosis type 1 (von Recklinghausen disease), and multiple endocrine neoplasia 2A and 2B. Carotid body tumor is the most common head and neck paraganglioma, highly vascular avidly enhancing located at the carotid bifurcation splaying apart the ICA and ECA. 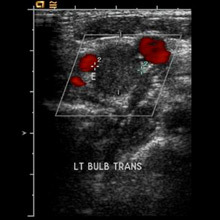 Carotid body tumor on MR intermediate T1 signal is isointense to muscle and on high T2 signal shows classic “salt and pepper appearance” attributable to low signal flow voids and high signal foci of hemorrhage and/or slow flow. Mass is hypervascular on catheter and CT angiography. Induim 111 octreotide scanning is useful for detecting multicenteric or metastatic lesions and for postoperative assessment of scar vs residual tumor. Carotid body tumor commonly presents as a painless mass at the angle of the jaw; may be pulsatile with 10% of cases presenting as cranial nerve V, VII, X, and XII palsies, or ipsilateral Horner’s syndrome. Carotid sinus syndrome manifest by bradycardia, hypotension, and loss of consciousness is either spontaneous or due to pressure and/or mechanical irritation by the tumor. Differential diagnosis includes medullary thyroid carcinoma, neuro-endocrine carcinoma, or schwannoma. Treatment of choice is complete surgical resection. Presurgical endovascular embolization, particularly for large tumors, is prudent to limit blood loss and operative time. Radiation treatment may be palliative adjunct for large and recurrent tumors not amenable to surgery. — Ashok Madan, MD, PhD, and Eric McGraw, MD, are staff radiologists at the Salem VA Medical Center in Virginia. Rao AB, Koeller KK, Adair CF. 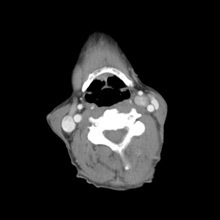 Paraganglioma of the head and neck: radiologic-pathologic correlation. Radiographics. 1999;19(6):1605-1632. Mathew BK, Bandgar T, Menon PS, Shah NS. Carotid body tumors: three case reports. Singapore Med J. 2009;50(2):e58-60. Wieneke JA, Smith A. Paraganglioma: carotid body tumor. 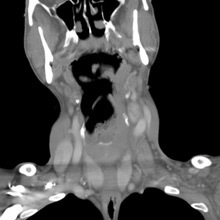 Head Neck Pathol. 2009;3(4):303–306.